Street stage vehicles are a central part of Taiwanese culture. These mobile stages for festivities such as weddings and funerals are a very common sight. They are also a venue for entertainment at music festivals. 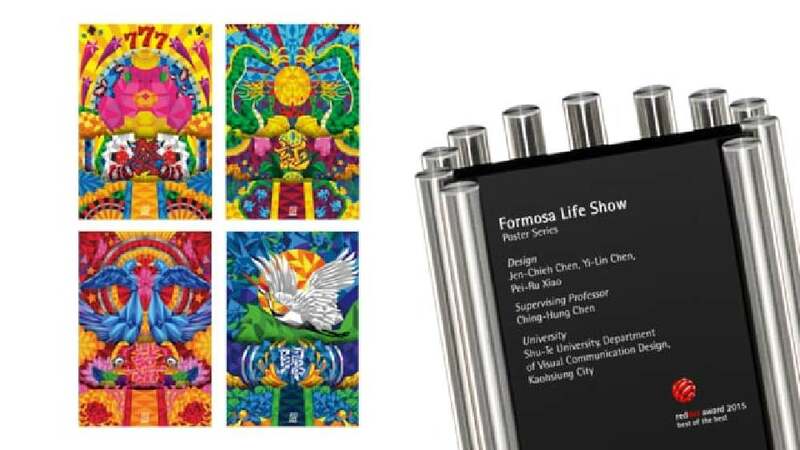 With the aim to create a new identity for these vehicles, the “Formosa Life Show” posters combine four traditional symbols with four different themes (weddings, funerals, joyful events, and special celebrations). With a design that focuses on the essential elements, they achieve a contemporary appeal. The integration of laser stickers as well as the use of a special colour concept follows the design goal of enhancing the expressive impact of these posters. They visualise the liveliness of street stage vehicles and emphasise their appeal, especially at night. The “Formosa Life Show” posters successfully lend the street stage vehicles, a highly popular part of Taiwanese culture, a different identity. In a highly consistent way, they reflect the zeitgeist with integrated laser stickers while also following up on the vehicles’ original meaning. Through an inspired interpretation, the traditional symbolism and colouring is given a new expression.